THIS ARTICLE WILL FOCUS ON THE CANNON BONE AND HOW IT RELATES TO THE LIMB. WE SELECTED LIMBS WITH AND WITHOUT FAULTS TO SHOW AND EXPLAIN WHAT WE SEE. 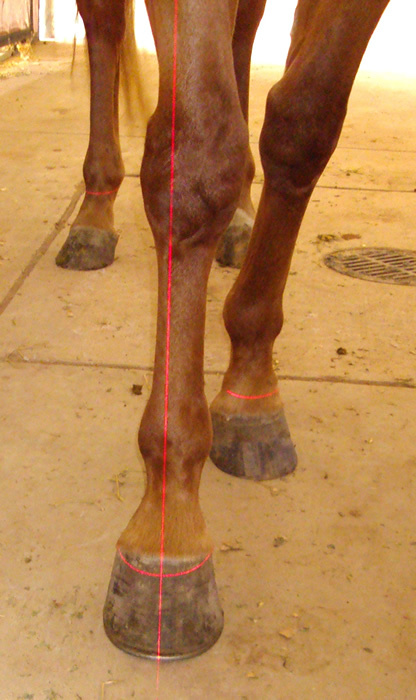 Understanding the basics of these reference points will help develop your eye so you can help your horses achieve better health through better balance. Seldom will you find a horse that has perfect conformation and we do not imply that you should strive to "correct" a mature horse with faulty conformation. 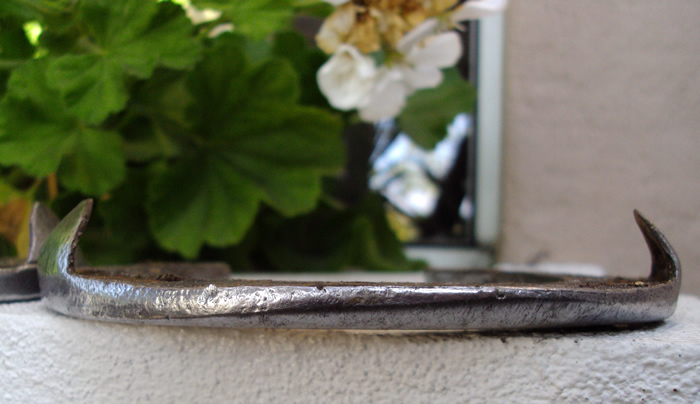 We do feel a farrier can help any conformation, good or bad, by trimming and shoeing to complement the conformation. The left front leg of this horse is fairly normal. This picture shows a centered cannon bone and a properly trimmed foot. 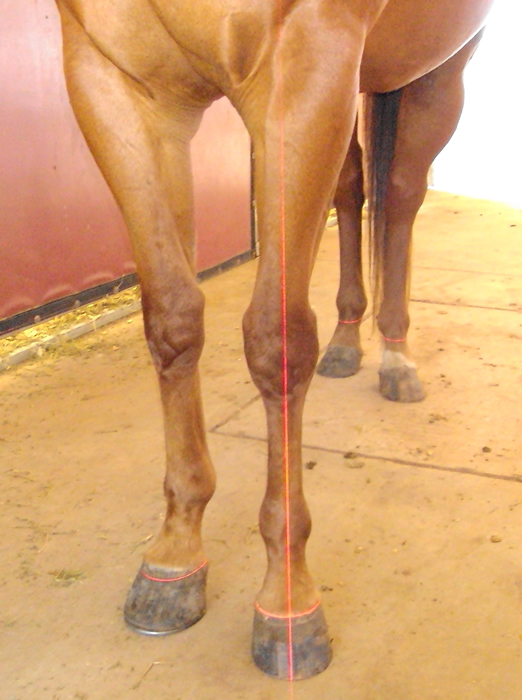 The cannon bone is centered below the knee and the laser line bisects it perfectly as well as the ankle, pastern and hoof. Notice we are not standing directly in front of the horse. We are looking at the limb and cannon bone from the direction it is pointing. This is very important to determine the true center of the cannon bone and limb. There is a slight flare on the lateral side of the foot that is reflected with a separation in the white line area on the lateral wall. 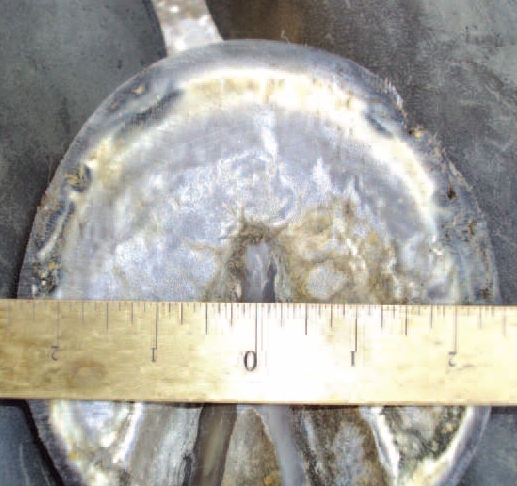 A regular shoeing schedule and proper fit shoe will take care of this foot. The right limb of the same horse tells a different story. This picture shows a knee that turns out laterally and a twisted or rotated pastern that places the entire limb inside of center. This is a conformation fault. This horse is conformationally challenged and many times this type of conformation is improperly trimmed. Again, we are not standing directly in front of the horse. We are viewing the limb from the direction it is pointed. The cannon bone on this limb is offset to the lateral side. This type of conformation will cause the medial side of the foot to rotate medial and/or flare to the medial side. Trimming the outside of the foot would cause a higher medial heel and eventually shear the medial side of the foot. (3) balance of the foot from the frog to medial and lateral sides at widest part of the foot The information you get with these observations will be critical in determining how to approach the trim. We feel that after you get acquainted with the 12 step reference process you will eventually be able to predict the shoe wear on each limb before you pick up the leg. As we mentioned in an earlier article (Natural Angle Vol. 12, Issue 1) each action has a reaction. You will learn that each conformation fault will have a certain wear factoron a shoe. You will also be able to see that flares on the outside of the foot will be equally visible on the bottom of the foot. So after careful examination of a horses limb conformation and before starting the trimming procedure one should carefully consider the three points listed above.